A billboard criticizing Christianity is going up in Charlotte, North Carolina, host city of the upcoming Democratic National Convention. Washington (CNN) - A prominent atheist group is using next month's Democratic National Convention to take aim at the presidential candidates' religion, putting up billboards targeting Mormonism and Christianity in Charlotte, North Carolina. “Our political system is rife with religion and it depends too much on religion and not enough on substance," said David Silverman, president of American Atheists, sponsor of the ads. "Religion is silly and religion has components that are inherently divisive. … There is no place for any of that in the political system,” he said. The billboards go up Monday in Charlotte and will stay up for a month at a cost of roughly $15,000. The Democratic convention runs September 3-6. The Mormon billboard features a man in white underwear, a reference to special Mormon garments. 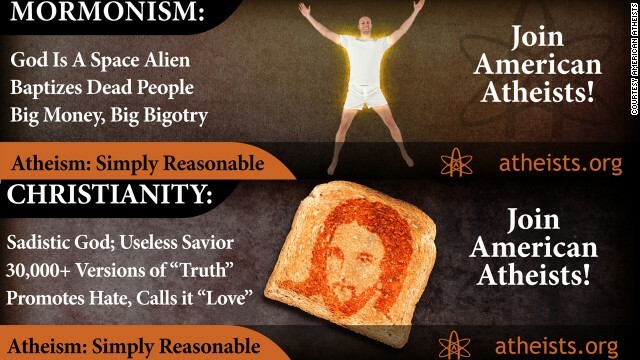 Both billboards feature the line "Atheism: Simply Reasonable." American Atheists had wanted to put the anti-Mormon billboard in Tampa, Florida, to coincide with the Republican National Convention there later this month. Presumptive GOP nominee Mitt Romney is a Mormon. When no billboard company in the city would lease the group space for such a sign, Silverman said the organization decided to focus solely on the Democrats in Charlotte. Some religious leaders said the billboards showed a misunderstanding of how faith works. "That billboard makes the most common high-school error when it comes to atheism," wrote the Rev. James Martin, a Jesuit priest and author, in an e-mail to CNN. "It's not arguing against the existence of God, but against religion. The American Atheists need to go back to school on this one." Martin also questioned the language used on the billboard: "And as for 'promoting hate' they're doing a bang-up job themselves with that billboard." Terryl Givens, a Mormon professor at the University of Richmond, called American Atheists "petty and vindictive." “If this example of adolescent silliness is what atheists mean by being reasonable, then neither Mormons nor other Christians have much to worry about," he said of the billboards. "When atheists organize to serve the poor and needy of the world, they will be taken more seriously." It's not the first time the American Atheists group has released in-your-face billboards. Earlier this year, the group put up two billboards in heavily Muslim and Jewish enclaves in New Jersey and New York bearing messages in Arabic and Hebrew. “You know it’s a myth … and you have a choice,” the billboards said. At the time, Silverman said the signs were intended to reach atheists in Muslim and Jewish areas who may feel isolated because they are surrounded by believers. In addition to the billboards, Silverman said his group plans to stage protests at both conventions. You will have to pay for these options, of course, but it is nice to be able to receive a laptop which is tailored to your needs. Make sure you read both professional reviews and user reviews, especially reviews by users that have owned the laptop for a few months. Я люблю каждый день и ночь по несколько раз своего партнера Стивена, мы хорошо ладим и даже думаем зарегистрировать наши отношения и усыновить несколько детей в Германии! Мы живем в свободной стране и хотим строить свою жизнь свободно по современному, поэтому нам плевать на всех вас и что вы о нас думаете – МЫ ГЕИ И ЭТИМ ГОРДИМСЯ! Я очень люблю своего партнера Стивена,мы хорошо ладим и даже думаем зарегистрировать наш брак и усыновить несколько детей! Мы живем в свободной стране и хотим строить свою жизнь по современному,поэтому нам плевать что вы о нас думаете – МЫ ГЕИ И ЭТИМ ГОРДИМСЯ !!! Little children are silly for believing in Santa Claus. Adults are silly for believing in Jesus/God. again, dorothy with her incredible intellect. it is true. comparing santa claus with jesus christ shows neither one really existed. Unless you somehow "know" the "heart" of Hitler, the only thing that we have to go on on what he believed is his own writings, and it was laced with religion, and him thinking that he was doing the will of god." if religion was never invented or developed or thought of or... or ... whatever... this world would be ONE HELL OF A BETTER place for all of us. Less fighting, less wars (actually, almost NO wars) and NO really crazy crap like 911. Take your bibles and all your hocus pocus fairy tales and throw them in the dump. Then, sit down and use your GD brains, if you have any.